This chapter assumes that you are familiar with the process of exporting from and importing into Studio. If not, see Using Studio. DeepSee folder items, which include all the items that are not defined as classes. These include pivot tables, dashboards, pivot variables, and so on. Export all the folder items to one or more DeepSee container classes, as described in the next section. A DeepSee container class contains an XML representation of any number of DeepSee folder items. Export the cube, subject area, and KPI class definitions. You can create a project that contains all your DeepSee class definitions and folder items. Then you can export this project from Caché and import it into another Caché instance, where needed. You can use the Studio export/import options or you can use the usual class methods in %SYSTEM.OBJ. Examine the exported folder item definitions to make edits for portability. Import all the class definitions to the target system. When you compile the container classes, DeepSee iterates over all the folder items contained in those classes and creates or overwrites each of those items in the target system. dashboardname.dashboard where dashboardname is the name of a dashboard. 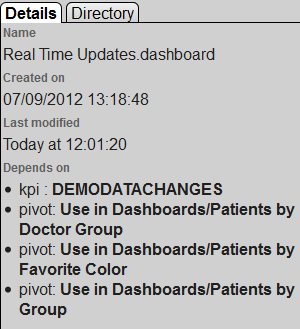 You can use the wildcard * to represent all dashboards; you can use the wildcard with the other types of items as well. 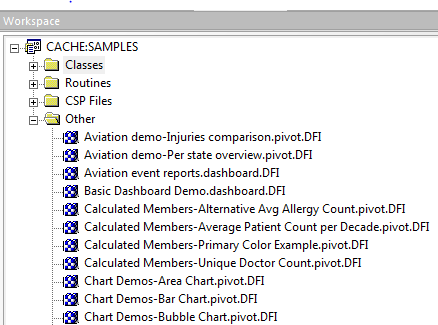 pivotname.pivot where pivotname is the name of a pivot table (or use *). 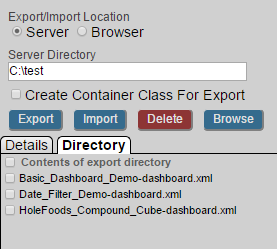 Note that the %ExportContainer() method identifies all the pivot tables used by any dashboard you export. The only pivot tables you need to export explicitly are the pivot tables that are not used by any dashboard. namedfiltername.namedFilter where namedfiltername is the name of a named filter (or use *). sharedcalcmembername.sharedCalcMember where sharedcalcmembername is the name of a shared calculated member (or use *). listinggroupname.listingGroup where listinggroupname is the name of a listing group (or use *). pivotvarname.pivotVariable where pivotvarname is the name of a pivot variable (or use *). settingname.userSetting where settingname is the name of a user setting (or use *). termlistname.termList where termlistname is the name of a term list (or use *). themename.theme where themename is the name of a dashboard theme (or use *). widgettemplatename.widgetTemplate where widgettemplatename is the name of a widget template (or use *). linkname.link where linkname is the name of a dashboard link (or use *). reportname.report where reportname is the name of a dashboard report (or use *). pFileName is the name of the file to generate. pContainerClassName is the full name of the container class to generate, including package. If you intend to copy a DeepSee folder item to another system, it is worthwhile to examine the exported XML and make any necessary edits, discussed in the following subsections. When you export a dashboard, DeepSee does not automatically export any pivot tables that it uses. It is your responsibility to identify and export the pivot tables as well. References between DeepSee elements (such as from a dashboard to any pivot tables) are made by name. If it was saved in a previous release, a folder item definition might contain <filterState> elements, which are no longer supported. If so, you should remove these  that is, remove both the starting tag <filterState> and the matching ending tag </filterState>. Where found: <widget> elements in exported dashboards. Or remove the localDataSource attribute. Where found: All folder items. Or you can remove the attribute. This element contains the name of the resource used to secure this item, if any. If this resource does not exist on the target system, edit this attribute. You can set the attribute to null or even remove the attribute. This element contains the name of the user who created this item. You can set the attribute to null or even remove the attribute. If you do so, when the XML is imported (or the container class is compiled), createdBy is set to the current user. This element contains the name of the user who created this item. You can set the attribute to null or even remove the attribute. If you do so, when the XML is imported (or the container class is compiled), timeCreated is set to the current time stamp. pReplace specifies whether to replace the existing class. Note that %ImportContainer() automatically calls the %OnLoad() method if it is defined in the container class. This section describes how to use the Folder Manager to see the dependencies of an item, export items, and import items. You can also export and import in Studio, as described later in this chapter. Select DeepSee > Admin > Folder Manager. For Server Directory, type the full path of the directory in which to export the items. Or type the name of a directory relative to the directory that contains the default database for this namespace. Or use the Browse button. The directory must already exist. Click the check box next to each item that you want to export. Or to select all items, click the check box at the top of the column of check boxes. Optionally click the Directory tab, which shows the files in the given directory. Specify Server and Server Directory as in the preceding steps. Select the items to export. Select the option Create Container Class For Export. Optionally select Export Related Supporting Items to export all supporting items that might be needed to deploy the selected folder items. Examples of supporting items include pivot variables, named filters, and shared calculated members. For Container Class Name, optionally specify a fully qualified class name (package and class). If no Container Class Name is specified, both the container class and the export file will use generated names. Optionally select Export Related Supporting Items. Click DeepSee, Admin, and then click Folder Manager. For Server Directory, type the full path of the directory that contains the exported items. Or type the name of a directory relative to the directory that contains the default database for this namespace. Click the Directory tab, which shows the filenames for items in the given directory. Click the check box next to each file that you want to import. Click OK at the prompt to continue. Or click Cancel. For the items created when you import the files, the owner is the username under which the Caché service runs, for example _SYSTEM. Click the Directory tab, and then click Choose File. In the Workspace window, expand the Other folder. Find the item that corresponds to the folder item table definition. Here its displayed name starts with $TRASH-, followed by the complete original name. Right-click the item, and then click Export. Specify the name of the file and click OK.
For folderName, specify any string that does not start with a dollar sign ($). This can be the name of an existing folder or a new one.